This book takes me back to my first love, Cowboys. 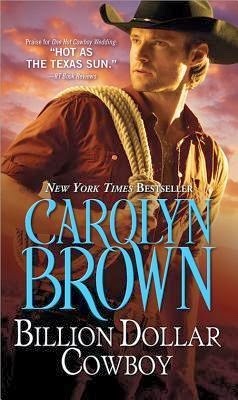 This is the second book by Carolyn that I have read and I am now in love with her writing; her characters, her pace, everything. When I first started reading romances, the western novels were my favorites, the sweet southern gentleman, hardworking and hot as hell were the men who I fell in love with. This book has it all, honest, down home cowboy who despite his wealth is still sane, and just another guy. I loved him, and his family almost from the get go. Laura is my kind of gal, she's real, raw but has a few little quirks (who doesn't). We meet his love interest who is only there because she is there to help her sister, Laura isn't looking to meet or fall in love with anyone much less Colton. Laura is a chronic enabler, she fixes her sister's problems all the time and this time she's going to quit with a little distance. Colton's family is looking for a way to get the gold diggers off his back, and they hatch a plan to save him & they need Laura's help. The story that unfolds moves fast, as the little charade goes on, more information about Colton & Laura comes out, trouble comes looking at the ranch and many different little dramas happen. I was all about this book, I read it in two days, I just couldn't put it down I loved it.It reminded me of why I fell in love with country music, gave me a new artist to check out (Blake Shelton) and even inspired a new series for this blog. Make sure to look out for the Books & Music Page and the playlist inspired by this book.